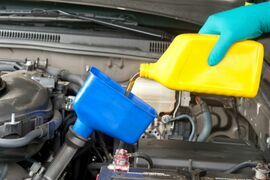 Are you trying to save a little money when it comes to servicing your car in Rome? Take a look at these great car service and maintenance coupons. Keep your car and wallet happy at the same time! Just print one off and bring it in today! Ladies, come on in and save on our oil change service every Tuesday, Wednesday, and Thursday. *One coupon per customer per visit. Cannot be combined with any other offer. Prices subject to change without notice. Must present coupon upon arrival. See service advisor for more details. Prices do not include tax, shop supplies, or environmental fees. We open our doors at 7:30 am and begin our oil change appoinments. Our Master technicians arrive at 8:00am and from there we take all other major appoinments. Pick up time is between 5:00 pm and 6:00 pm, as our Master Technicians leave at 5:00 pm. We greatly appreciate your business and allowing us the opportunity to serve you!